“It’s Lent! Bring on the Condemned Movies! And the Nun!”"I hope people will watch, because this is not a take-down of the Legion of Decency but a look at history," says Sr. Rose Pacatte Here is the list of movies that Tuner Network will show - I bet Dave will watch ever last one of them! Aleph. I am the man that see my poverty by the rod of his indignation. He hath led me, and brought me into darkness, and not into light. Only against me he hath turned, and turned again his hand all the day. Lam.iii.i. 130,000 Military Age Muslim Men In Germany Have Vanished! 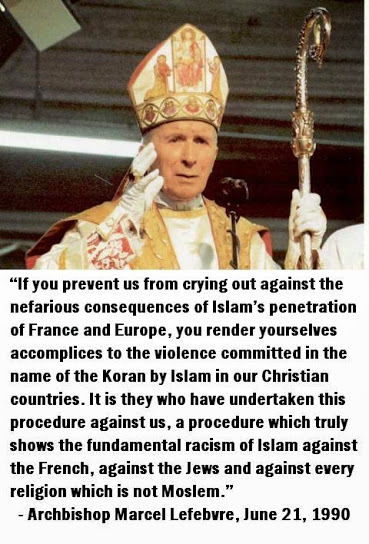 Are Muslims Lying In Wait To Invade Rome & Hunt Down SSPX Priests? Pope Francis Army Of Muslims Invaders Used To Conquer Rome! KNIVES ARE OUT! Pope Francis Dreams Of Becoming A Bloody Butcher Again! Is This A Veiled Threat Against Those Traditionalists Who Francis The Butcher Will One Day Murder? How the Modernists Triumph over the Traditionalists? Give the SSPX every thing it wants. Pope Francis to bring the SSPX back into the fold with no strings attached....then allow the SSPX to consecrate more Bishops.....allow the event to take place in Rome.....expect most if not all of the 700 SSPX priests to attend.....and let the Muslims target the site where the SSPX are gathered and that's that....end of the work of Archbishop Marcel Lefebvre.....a few SSPX priests may survive...but not enough to make a come back. If the scenario pans out.....and a new Bishop is consecrated.....one must be cautious and restrict the number of SSPX priest to attend the event. Just a heads up. Cedric Ford, 38, was a painter for Excel Industries, Hesston, Kansas. Ford shot 20 of his co-workers murdering up to seven. Ford is a avid gun collector. Ford was shot and killed by Police. Doom For Argentina President Mauricio Macri Flying To Rome, Where He Will Have A Meeting With Pope Francis The Destroyer! DOOM! DOOM! MEDITATIONS ON THE PASSION OF OUR LORD JESUS CHRIST: Then Jesus Went Forth, Carrying His Thorny Crown, & Purple Garment. I ~ Fr. Francois Coster S.J. VALDÉS LEAL, Juan de Ecce Homo 1657-59 Then Jesus went forth, carrying his thorny Crown, & purple garment. Consider first, how thy Lord came forth amongst the people. Behold a high place, to which they ascended by twenty three marble steps, (which are kept till this day at Rome with great reverence,) and before that a most spacious Court, filled with many thousands of people, who had assembled themselves out of all Judea against the feast of Pasch. All these so soon as they espied our Lord coming forth with Pilate, came pressing nearer, that they might better behold this sad and horrible spectacle. 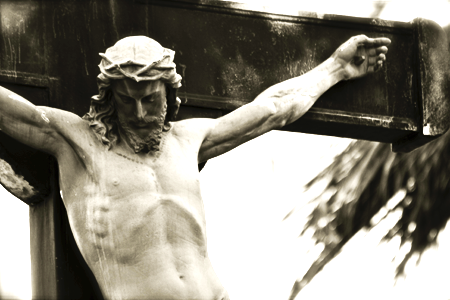 MEDITATIONS ON THE PASSION: THE XV MEDITATION How Caiphas Adjured Jesus To tell Him If He Were Christ.